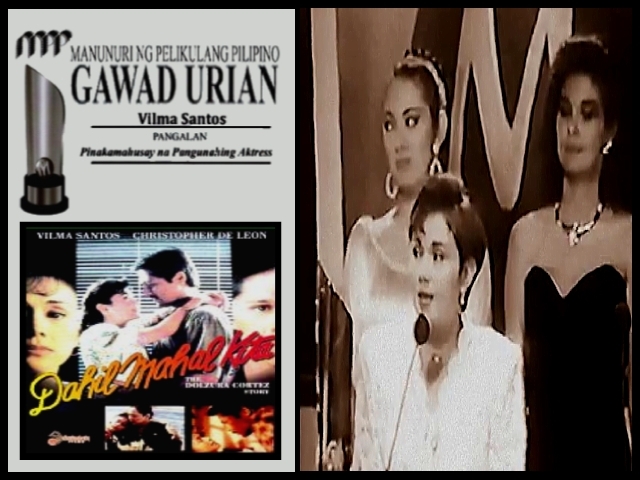 In her thank-you speech at the awards ceremony, Vi acknowledged the fact that “I would have been helpless without Tita Laurice, Tita Chato (Charito Solis, who played Vi’s mother), Boyet (Christopher de Leon) and other members of the cast and crew.” As usual, Vi was generous in her acknowledgments and ever her husband, Batangas Representative Ralph Recto, “above all”, got his share of the kudos. Even the jurors of whom I was one, were impressed by her acting. “She would win in any festival with this kind of performance,” says Gina Alajar, herself a Metro Manila Film Festival Best Actress awardee earlier this year, who pinchhit for Rudy Fernandez as juror. “What I like about her performance,” juror Josefino Cenizal, veteran composer and musical director, chimed in, “is that she never overacted in many scenes where less experienced thespians would have. She gives the impression that she’s not acting but just going through the scenes as if she’s a natural part of the scenery.” There’s only one actress I’ve seen in action who seems not to be aware of any camera (just like Vi) and that’s Julie Christie, the British actress, who did a movie scene in front of several journalists from all parts of the globe, including this writer, in a London pub in the 1960s. I have to confess that this article is a bit partial to Vilma Santos because I’ve been a Vilmanian from Day One. I remember the first time I saw Vi was in 1962 when Dr. Jose “Pinggot” Perez, Sampaguita Pictures executive, invited me to watch the filming of a movie called Trudis Liit. It was a nine year-old Vilma Santos who played the title role and she was so good, Doc Perez raved: “May kinabukasan ang batang ito (this child has a bright future).” Vi still remembers the reporter “who asked me silly questions like what’s my favorite dish, etcetera”. It was the beginning of a lifetime friendship and during those intervening 31 years, I’ve seen Vi blossom from a shy but hoydenish teenager, to the Vilma Santos of today, a confident woman of 39 “na maraming karanasan sa buhay (her own words)” pero sweet na sweet pa rin like the Vi of old. Some of those experiences would have driven an ordinary woman to perdition but not Vi, who says quietly: “A woman should grow wiser through the years.” Vi had the best teachers in the field of love. During the late ‘60s and early ‘70s, her “puppy love” was Edgar Mortiz which gave birth to the Edgar-Vilma loveteam, the only noteworthy rival of the Pip (Tirso Cruz III)-Guy (Nora Aunor) tandem. Her subsequent romance with Romeo Henares, son of former Inquirer columnist Larry Henares, nearly ended at the altar. “But I was not ready to make a lifetime commitment,” she disclosed. “Commitment” is one of Vi’s favorite words. This entry was posted in ARTICLES and tagged ARTICLES, Vi The Victorious. Bookmark the permalink.